Discover how scripting is different from command-line PowerShell, as you explore concrete hands-on examples in this handy guide. The book includes and expands on many of the techniques presented in Learn PowerShell Toolmaking in a Month of Lunches. Automate it! With Microsoft's PowerShell language, you can write scripts to control nearly every aspect of Windows. Just master a few straightforward scripting skills, and you'll be able to eliminate repetitive manual tasks, create custom reusable tools, and build effective pipelines and workflows. Once you start scripting in PowerShell, you'll be amazed at how many opportunities you'll find to save time and effort. 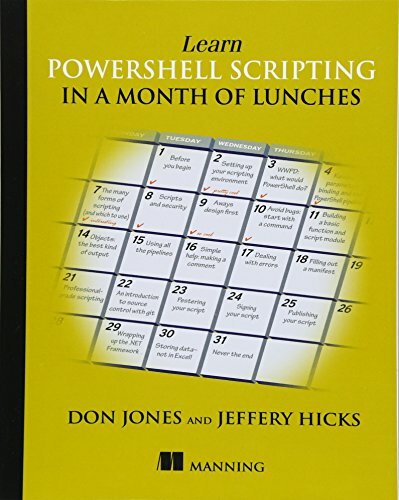 Learn PowerShell Scripting in a Month of Lunches teaches you how to expand your command-line PowerShell skills into effective scripts and tools. In 27 bite-size lessons, you'll discover instantly useful techniques for writing efficient code, finding and squashing bugs, organizing your scripts into libraries, and much more. Advanced scripters will even learn to access the .NET Framework, store data long term, and create nice user interfaces. Written for devs and IT pros comfortable with PowerShell and Windows. Don Jones is a PowerShell MVP, speaker, and trainer who has written dozens of books on information technology topics. Jeffery Hicks is a PowerShell MVP and an independent consultant, trainer, and author. Don and Jeff coauthored Manning's Learn Windows PowerShell in a Month of Lunches, Learn PowerShell Toolmaking in a Month of Lunches, and PowerShell in Depth. WWPD: what would PowerShell do?